Constructed: at the end of the 7th century B.C. Alterations: rebuilt in the 6th and early 5th century B.C. after it had been destroyed on multiple occasions through fire; further modified and rebuilt in the 3rd / 2nd century B.C. as well as in 36 B.C. 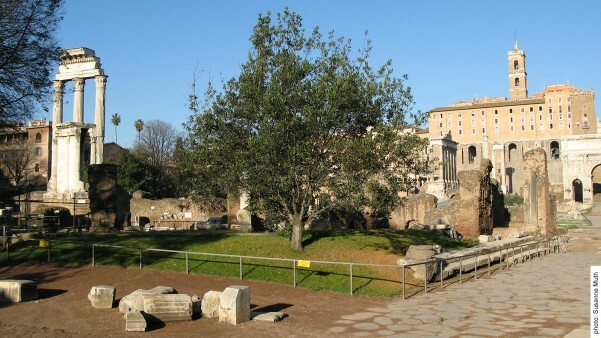 According to the legends the Regia was once the home of the Roman king Numa Pompilius and was therefore perceived as one of the most venerable buildings on the Forum. Since itwas erected the appearance of the building has hardly changed, just as the traditional cult acts at this place constantly remained the same. This noticeable reluctance towards “modernising” the building persisted throughout many centuries of Roman history. The conservation of its venerable physiognomy underlines the Romans’ veneration for this building, which was rich in tradition. The long history of the Regia’s construction is mirrored in the complexity of its material remains. Eight different construction phases can be reconstructed from the findings, whereas the fragmentary walls in the foundation only provide us with a sketchy idea of the earliest phases. The oldest archaeological remains in the area of the Regia belong to a settlement consisting of huts from the 8th and 7th century B.C., which expanded across the east side of the area that was later to become part of the Forum (see Early Period). In place of these simple huts a more complex structure, with a stone foundation and composed of clay bricks, developed there at the end of the 7th century B.C. This structure already possessed the general layout of all the later phases of the Regia, even if the scale and positioning of the individual spatial elements varied over time: Several of the smaller spatial elements were combined to form a group and opened out onto a courtyard that was enclosed by a wall. The Regia had to be rebuilt and extended in the course of the 6th century B.C. due to severe damage caused by numerous fires and floods, whereby the group had to be reconstructed often on other sides of the courtyard. Remnants of the rich terracotta cladding of the roof beams, which were found in the layers of different phases, indicate that this building was magnificently decorated, which underlines its exceptional status to this time. 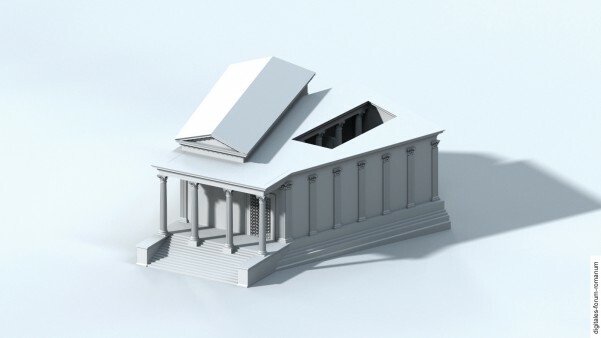 The structure was modified yet again at the beginning of the 5th century B.C., after the Regia had been destroyed by another fire, which some scholars see as closely connected to the downfall of the last king. The group of spatial elements was relocated to the south side of the courtyard, where they would remain. It is hard to retrace the restoration measures from the Republican period, when examining the archaeological findings. 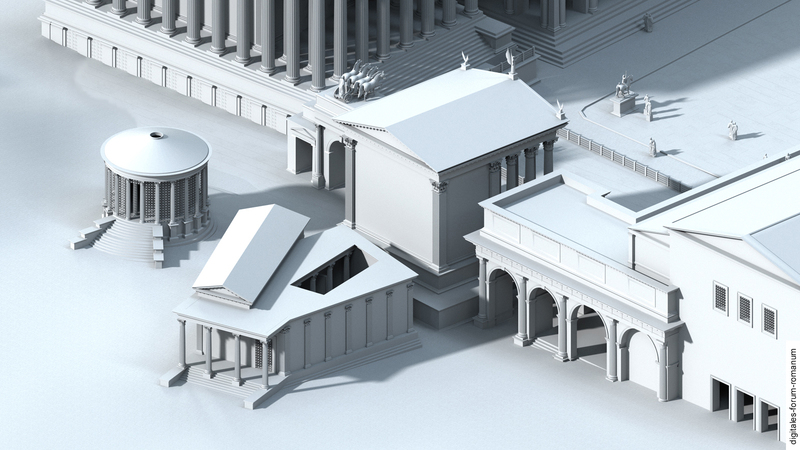 Individual observations have shown that the Regia was probably renovated in the late 3rd or early 2nd century B.C. 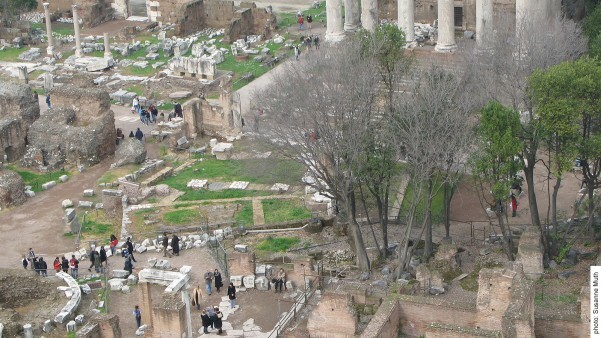 The literary sources inform us about another fire that destroyed the Regia in 148 B.C., whereby the only thing that was left standing was one of the two laurel trees in the courtyard. The present-day physiognomy of the Regia goes back to the fundamental restoration of the building in 36 B.C. under the reign of Cn. Domitius Calvinus. He financed these construction measures, which had become necessary after another fire had caused severe damage to the building, through the spoils from his military campaigns in Spain. Calvinus ordered that the Regia be rebuilt in its entirety in marble. Some of the parts of the entablature are still lying next to the ruin of the building at the present day. In addition, the literary sources report that the Regia was adorned with statues, which also alluded to the splendour of the newly restored building. While the written sources speak about the Regia’s destruction during the big fire of Rome in 64 A.D. under Nero’s rule, no traces of this destruction can be found within the archaeological findings. The same holds true for a fire in the late 2nd century A.D., which destroyed the adjoining Temple of Vesta. Just as the literary sources refer to the Regia as the home of king Numa Pompilius, most scholars refer to the building as the “residence” of the Roman kings – whereby the question is left open whether the building was the main residence or merely a kind of representative “office” for the kings. The magnificent decoration from the different construction phases in the 6th century B.C. underpin the special significance of this building. The fragment of a shard which was found there and had the king’s title (lat. “rex”) inscribed on it supports this thesis. After the last king was overthrown, his duties were transferred to the Rex Sacrificulus (and later to the Pontifex Maximus) as the highest priest. Accordingly, the Regia is believed to have been the home or (more likely) the “office” of the highest priest in Rome. This view gains further support through various passages in the literary sources: For instance, it was written that Caesar “lived” in the Regia during the 1st century B.C. in his capacity of Pontifex Maximus (which is why his body was burnt west of the Regia and the Temple of the deified Caesar was erected directly in front of the Regia). The Regia played an important role as a space where ritual acts could be performed. According to the literary sources, two shrines (lat. sacrarium), one for Mars and the other for Ops Consiva, were located inside the building. Within the sacrarium for Mars old shields and spears were stored during the late Republic and early Imperial Period; these weapons were then carried along in the seemingly archaic processions of the Salian priests. Next to the weapons there also was a fireplace, where the sacrifices were offered. These two cult rooms for Mars and Ops Consiva are associated with the smaller chambers along the south side of the courtyard. The remnants of the walls of these chamber are still visible on the excavation site at the present day. 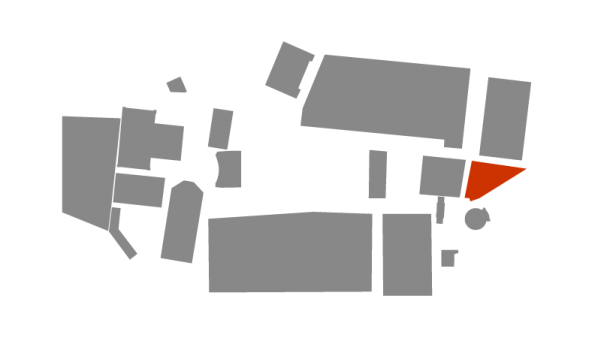 The various structures of the walls, which were created in the early construction phases and later discovered during excavations, cannot be seen on the excavation site at the present day; the only thing that is still visible are the remains of the walls that belonged to the early Augustan structure that was rebuilt by Calvinus. In the Middle Ages a residential building was built into the ancient structure, i.e. into the ruin – the brick walls that can be seen nowadays in the north-west corner, opposite the Temple of Antoninus and Faustina, belong to this medieval house. Like all the other ancient structures on the Forum, the Regia was later buried beneath the ground. Only at the beginning of the 19th century were the structural remains recovered during excavations. A more detailed discussion and scholarly reconstruction can be found in the wiki of the digital Forum Romanum (Georgia Bousia, Erika Holter, Maria Kames).